Language. We all have one or more. We all use it to communicate. A common language unites countries, while different languages can divide. Using at least a few words in other languages has been a necessity in A Tuscan Legacy, focused on a big family of Italian origin. Then add a range international settings. Three books set in Italy (That’s Amore, Ti Amo, and La Risposta) two set in the US (Luna Rosa and Rapsodia), one in England (La Fiamma Sacra), and one with multiple settings from Germany to Scotland to Paris (Bella Notte). And just to make my job as an author more interesting, I set Book 8, Dolce Vita, in Wales. Though part of the United Kingdom, Wales is a country in it’s own right, with its own language. All official documents and signs in Wales (Cymru in Welsh!) need to be in both English and Welsh, and learning Welsh is compulsory at school. I did keep things that little bit easier – rather than setting it somewhere almost everyone speaks Welsh in preference to English, I set it in the multi-cultural Welsh capital of Cardiff (Caerdydd in Welsh), where only 20% of the population speak Welsh. Only one catch. Though Rachel, the heroine, is English, the hero, Jon, is fluent in both Welsh and English. And Welsh is his first language. Naturally, he often thinks in Welsh. A language I’ve always wanted to learn. Dad lived in Wales in his teens, and sang a lot in Welsh, so I grew up with Welsh around me, but knew zero actual words. Okay, I think I can safely say I will probably never learn to speak Welsh. I studied Indonesian at school, and could write some but when I visited Indonesia discovered I couldn’t pronounce it so anyone understood. I’ve tried to learn French, could write some but had abominable pronunciation. More recently, I’ve been learning Bulgarian, both because it’s a country I’ve visited a few times, and I’d always wanted to learn to read the Cyrillic alphabet (used in Russia and a number of other Eastern European countries). No surprises – I can read far more than I can say! When it comes to Welsh, I’m not sure I’d ever get my clumsy tongue around some of the words. Like that place name. 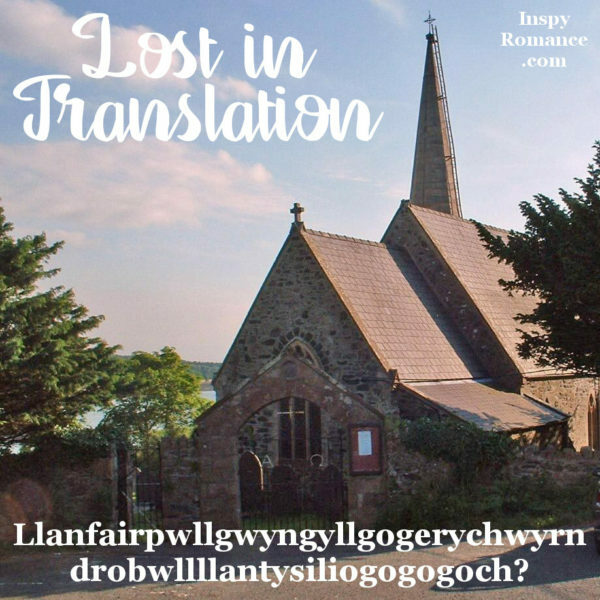 Llanfair­pwllgwyngyll­gogery­chwyrn­drobwll­llan­tysilio­gogo­goch. The second longest one-word official place name in the world. Oh my! Translated, it means “Saint Mary’s Church in a hollow of white hazel near the rapid whirlpool of the church of Saint Tysilio with a red cave”. And the name was actually invented in the 1860s when the railway station was built. The original name was Llanfairpwllgwyngyll. Right. Not sure I’ll try saying that one, either! If you want to apparently it sounds something like this Thlan-vire-poothl-gwin-githl-go-ger-igor-chwen-drob-oothl-landus-ilio-goh-goh-goch. The really fun thing was learning some Welsh words of emotions and love. It’s a romance, after all! Welsh is a beautiful, poetic language. Many words don’t have a direct English translation. Like Hiraeth. Homesickness. Nostalgia. Longing for the place we belong. And enaid. It can be translated as friend. But, thanks to my wonderfully multi-talented editor, who amazed me by disclosing she CAN speak and read Welsh, I discovered it means far more. It can also mean soul. Soul friend. Far deeper than just friendship. A friend of the heart and of the spirit. Jon and Rach have been enaid for many years. But will a wedding bouquet lead to them becoming more? And can Rachel forgive past hurts enough to find she does belong in the Rossi family? There are many more Welsh words and sayings in Dolce Vita. A couple, like maldod and cwtch,will become part of my vocabulary. Uh, if I every learn to pronounce cwtch, that is! Dolce Vita is currently just 99c or can be read free in Kindle Unlimited, along with the rest of the books in the series. 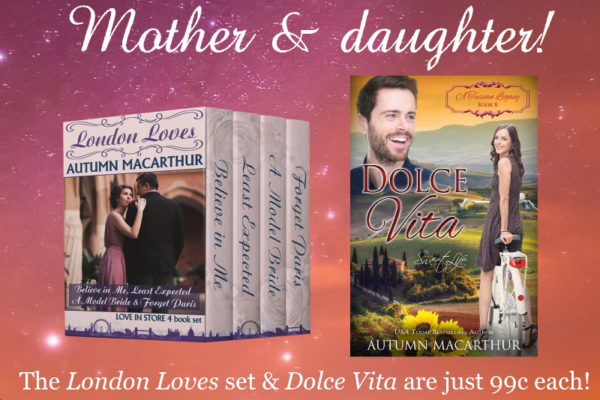 And the story that helped inspire A Tuscan Legacy, showing Rachel’s mother Maggie find new love, is also available for 99c this week as part of the London Loves boxed set. Can you speak any other languages besides English? Or are there any languages you’d especially like to learn? One comment made on this post before June 16 will be randomly chosen to win a copy of London Loves, or winners choice of my ebooks. My parents visited Wales some time back and said it was beautiful. I doubt I’d get my mouth around the language. Glad to see it being encouraged. Hi Mary! Wales truly is beautiful. I’m glad they are keeping their language alive with Welsh being taught to all ages in school now. I’m German and have a Master’s degree in translation (English and Italian). I studied in Bristol and Trieste and loved it. And I can hardly wait for book 9. I also studied Russian for 8 years and French for 3 as well as Latin and some Spanish for my A-Levels. Wow! What a fabulous range of languages! Wonderful that you had the opportunity to study in Trieste and immerse yourself in the language. Hi Autumn, Welsh looks difficult! I do not speak another language, only a few words here and there. My best friends’ husband is Polish, and only speaks Polish to their daughter, so she is growing up to be fluent in English and Polish. I think it would be easier to learn another language if one were living in that country, or taught from birth. Oddly enough, I think learning Latin would be cool!! I only have a few words here and there in other languages too. I think if I dedicated more time to learning a little everyday, I could improve. Not sure about my atrocious pronunciation, though. I fear I may be stuck with that My husband has a wonderful gift for accents (and works hard to improve his vocabulary and grammar, too, unlike me! ), so even if he doesn’t know many words, can sound like a native speaker. Latin would be fabulous! Used so much in science and medicine, and the basis for many European languages, too. Autumn, Latin is, as you say, the basis for many European languages, making learning French and Italian verb tenses much easier. However, it’s also basic to understanding much of our English vocabulary as well as how our grammar works. Latin students who have learned the accusative case will never again mix up when to use “who” or “whom.” They will also know not to use “I” after a preposition. I studied Latin for 9 years, and Greek and Italian for 3, then taught Latin and later Greek and Latin etymology for several years. I’ve always wanted to learn Scottish Gaelic, but I’ve discovered that hit-or-miss study won’t work. It takes true immersion in a language to really learn to read and speak it. Kathryn, I often think Latin should be compulsory, because it underpins so much! I was sorely disappointed in high school. Our first year there, we did a language taster – a term of each. I loved the latin and really wanted to keep on with it, but unfortunately the school didn’t offer classes. Wow, I’m impressed with your language background. And I love etymology – so fascinating to see where words come from and how they’ve developed and changed. My feeling is that all the Celtic languages can be challenging to learn, because of the different sounds. Undoubtedly immersion is the best way to learn a language, but not so easy to achieve! English is actually my second language but I haven’t been all that successful with trying to acquire a third. You are doing better than most people acquiring a second language! Learning new languages as an adult doesn’t come easy, especially if one isn’t surrounded by native speakers. Having a daughter-in-law from Chili, I would love to be able to speak Spanish. Since Living in Texas, it would also be an advantage. Hi Kathy! Spanish would be useful in much of North and South America, such a strong Spanish influence from the history of colonisations. A language I wish I knew more than a few words of! Hi Autumn! I was born in Berlin, Germany and learned English as a second language. Since I learned English as a child, I speak both language accent free. My parents usually spoke in English, while my brother and I often answered in English. I taught high school English and have taught German from Grades 1 thru college, since I have a degree in both languages. I have tried to learn Spanish and just like you I can do the book work but can’t speak it. My husband picks up languages easily. He studied Spanish in high school. German in college. Hebrew and Greek in seminar. He also knows some French and Dutch. Love the long Welch word. For extra credit I always gave my German students a 79 letter word to break up into parts and translate. It was a name of a shipping organization. Even though I am only bilingual, as a foreign language teacher I enjoy studying the structure of other languages. In reality we all speak some other languages since all countries adopt words from other languages. Kindergarten is German. Mattress and sherbet is Arabic. In my culture classes, I gave students a list of words and had them guess which language they belong too. Students liked the exercise and the realization they are multi-lingual, even though only fluent in English. NO need to include be in the drawing. I already have the London Loves Boxed Set. Enjoyed reading the entire Tuscan Legacy series and your delightful romance Dolce Vita: The Sweet Life. Best wishes. You are in my thoughts and prayers. Hi Renate. Yes, learning a language in childhood is definitely the best way to speak it without any accent. I’m not sure when it is – age 10? – there’s a cut-off point where language learning becomes more work. You make a good point about us already knowing more words than we think we do in foreign languages! At one stage when I was trying to learn French, the tutor pointed out that English speakers already know at least 30% of French words, we just needed to learn to pronounce them differently. That’s the part I always have most difficulty with! Like you, my husband has a wonderful gift for accents and language learning. I think at present he is learning Mandarin Chinese, Japanese, Arabic, Farsi, Hebrew, Latin, Ancient Greek, Swedish, Bulgarian, Russian, and Albanian. Oh my, what a list! He rotates between languages. On top of already having conversation French, and enough German and Spanish to get by! While on our honeymoon in Paris, he let me use my terrible French. Only later did I discover he is near fluent. I wasn’t sure whether to be grateful he let me try, or annoyed with him! I only speak English but am fluent in typo. I know a few phrases in German, (can ask if you have a biro and what is your name and how are you). Hi Jenny! LOL, I am fluent in typo, too. I guess that’s my second language. ;) Though lately my typos are even more annoying – I write real words starting with the same letter, just not the one I was thinking, so spellchecker doesn’t pick them up! Hi, Autumn! I am amazed at the languages you do know. I have your books in my TBR pile and plan to read & review them. English is my one and only language. Even with my native tongue, it is hard to keep up with all the new words that I hear every day. BTW My English teacher would be appalled if she could hear the way that people talk today. You’re so right, Janet, English is a rapidly evolving language and always has been. Unlike say Icelandic, which has changed so little since medieval times that a modern Icelandic speaker can still easily read the Eddas and other texts written 800 or more years ago. But the speed English is changing at definitely seems to be getting faster. I need to look words up all the time! I took German in junior high school, French in college, but now when I tell my brain “foreign language,” usually Cantonese comes out (we were missionaries in Hong Kong for 19 years). I’ve also studied Khmer, the language of Cambodia, but I was in my late 50’s when I tried to learn it, so I’ve forgotten a lot more than I can remember now. That’s impressive, Margaret! I’m sure those years in Hong Kong would have embedded the language firmly in your mind. I don’t know much French, but oddly when I’m trying to remember a word in Bulgarian, the French word pops out! I’ve been waiting for Rachel’s story and I’m really looking forward to some down time to read Dolce Vita. I was born in Brazil, so Portuguese is our official language, but I’ve started learning German (because of family tree) and English (because of international communication) since I was a kid. Also, living in south Brazil, we get to learn a bit of Spanish just because.. which these days means I can understand almost anything in Spanish and have a fairly good pronunciation (but with little vocabulary). I also dropped most of my German learning a while ago when school took charge (high school probably), but I can get the basics out (I’ve been singing children’s bedtime songs to my baby). I can also pronounce words fairly well, I just don’t know what words mean most of the time. Now I want to say I’m a pretty good speaker, writer (academic writing is 90% in English these days), and listener of the English language. I do get grammar issues once in a while, mostly mixing up my prepositions, but if I didn’t feel comfortable enough writing and speaking, I couldn’t get my research published at journals and conferences (or written a full dissertation at Cornell University). So all that being said, I’ve also learned Latin in high school, which means I can get the basics of Italian, French, Spanish, and Portuguese but nothing fancy and nothing too complicated, like Dolce Vita would have similar words in those languages (Doce Vida, in Portuguese) so it is pretty easy to know the meaning of all your Tuscan Legacy book titles. My favorite is That’s Amore (Amore is spelled “Amor” in Portuguese). Wow, Priscila! That’s an impressive list of languages. How did I never know you lived in Brazil? Your English is fabulous, none of those tiny clues that often hint someone with otherwise excellent English has it as a second (or third or more!) language. I hope you’re enjoying motherhood, and that all is going well for you. Praying too, because I’m sure juggling a baby and an academic career has plenty of challenges. I haven’t used much German and Spanish but I’ve travelled to Germany twice and to Latin America Spanish speaking countries so those were useful languages to know at one point in life. I have found memories of my Grandma singing in German so I try to share them with Sam. Wishing you and your family the best too. I remember from previous posts that you’ve gone through tough times recently. Ah, that’s why I didn’t realise! It’s wise to have family nearby with a new baby. We need the support at times of such huge transition. Singing to him in German is a wonderful idea, I love it, especially the way it reinforces sweet family memories for you. Handing that down to your son is a wonderful gift. He may grow up tri-lingual! And I’m glad you’ve been able to find a way to juggle your academic work and motherhood. The internet enables most work to be done remotely, but sadly not all employers see it that way! I imagine it’s not always easy, so I’ll keep praying. And thank you for your prayers. My husband is disabled and chronically ill, and he’s had a prolonged flare-up. He needs periodic treatment for one of his health issues, which unfortunately exacerbates everything else. But it’s passing now, and I’m thankful! I can understand Italian, written and spoken sloooowly…but can not speak it other than a few words! Love the London series, looking forward to reading the Tuscany series!! So sorry to keep you wait for Book 9, Paula! FInally on the right track with it, thanks to God and lots of prayers. I think many of us are in that situation of understanding far more than we can say! We came across some similar LOOOONG Maori names when we were in New Zealand recently. One particular one was Tewhakarewarewatangaoteopetauaawahiao, which simply means “The coming together and the uprising of the warriors of the war party of Whakarewarewa. I speak English and Afrikaans, and it’s so true what Renate said about similarities. While in New Zealand we started up a conversation at a cattle crossing with another motorist in the car behind us. He heard my niece speaking Afrikaans, and he promptly started conversing with us in Dutch. The languages are so similar that we could both understand each other perfectly. We did switch to English though LOL. LOL, I would have laughed if you’d found another Afrikaans speaker in NZ, after coming across with one in Finland on your trip last year! Apparently the longest official place name in the world is Maori. It’s a wonderful liquid language, but yes, they compound words get enormous! Oh, there are a LOT of South Africans in New Zealand, so coming across one is quite possible. In fact, when we went to visit the Alpaca farm, the young woman working there and giving the tour was a South African (as are the owners of the farm). We just clicked with her (she’s such a beautiful soul), and in fact, it turned out that her mother lives in the neighboring suburb to me (so I brought a prezzie and letter home for her mom). My friend who lives in NZ is from South Africa. My other friend who was from Australia spoke Afrikaans also. I know a few words but that’s it. That’s so funny, Marion! I know there are plenty of South Africans in both Aus and NZ, but you keep meeting them, too! I speak English REALLY well. However, I do know “some” Japanese, and Sign Language. I’d really love to learn Italian and French. They both seem to flow when they are spoken. I’d also like to learn them because of being half Italian and a fourth French. The other fourth is Greman and I’m not too excited about learning it. I’ve never heard Welsh, but I think Welsh, Scottish, and Irish all would sound beautiful too. Sort of like fairies singing. Italian and French do sound wonderful when spoken, Marylin. We’ll not by me, but by people who can speak them! “Faries singing”! I love that description! My editor has learned Welsh. She said she used to love reading the poetry aloud because it sounded like singing. I very briefly studied bot German and ASL but can’t say I really learned much. I would like to try learning sign language again at some point, though. Me too on the sign language, Jessica. I just wish there weren’t the variations in sign language between countries.. I’m not sure how different British sign language is to American , but I know it IS different. For one of my books involving differently abled kids, I researched Makaton, a form of sign language used with learning disabled kids who are unable to speak. It sounded fascinating! How interesting. I’ve never heard of that but it sounds like a neat form of communication. I learned some French in high school. My grandmother and mother spoke French when they didn’t want the kids to understand. I speak a little Spanish. My daughter ,son in law , and grandchildren are fluent in Spanish. Hi Diana! LOL at you mom and her mom using French so the kids wouldn’t understand! Sounds like you have a real multi-lingual family. Great for kids to grow up bilingual, I think. Glad to hear I’m not the only one who can dabble in reading a bit of a language, but have an atrocious time with the spoken version. French, in my case. My Cardiff story from vacation a few years ago: knew I was getting tired and should be done with my museum visit when I realized I was confusedly trying to read the Welsh side of a label and not the English. LOL at your Cardiff story. There’s actually a recognised name, can’t think what it’s called, for that overwhelm we can get in museums, art galleries, and visually rich historic sites. So much beauty and wonder temporarily scrambles our brains. Especially if we add jet lag or fatigue on top. I only speak English, and the Kentucky version at that! I took one year of Spanish in high school but only remember a few words. If I were to tackle a new language at this time, it would be Spanish. Wow Rebekah, that app sounds interesting! I will need to look at that when I don’t have a book deadline. Your daughter is off to a great start, and is at a great age to learn, too. LOL at the “another English”. That’s so adorable. One of my husband’s life goals is to get to conversational level in 22 languages. As apart from English and French he didn’t start till his forties, my guess is he needs to live till at least 100 to achieve it, but that’s okay! I am fluent in English and Spanish,understand some Portuguese, and Navajo.